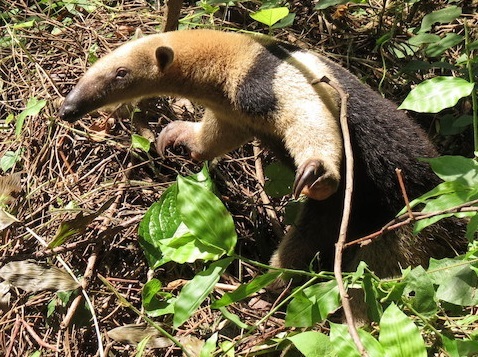 Fundación Pro-Bosque (Pro-Bosque), conservation partner of World Land Trust (WLT) released a rescued Northern Tamandua in the Cerro Blanco Protected Forest of Ecuador last month. The tamandua was brought to the reserve by the Environmental Police, who rescued it from a house where it was being kept as a pet. Pro-Bosque reports that although there is traffic in baby tamanduas for the pet trade they are not as common as bird, monkey and reptile species, possibly due to the potent smell of their urine, specific dietary requirements and the destructive behaviour of some individuals. This particular individual arrived at the reserve in good condition and was released quickly into the Ecuadorian dry forest where it nimbly climbed up the nearest tree. Tamanduas have distinctive features due to the combination of their anteater ancestry (they are in the same family as the Giant Anteater and the Silky Anteater) and their arboreal lifestyle, with the tubular snout and sticky tongue of their cousins but the long limbs and prehensile tail of a primate. Although it is not considered endangered by the IUCN, there is a reduced population in Ecuador due to the local belief that they attack domestic dogs. Tamanduas are not known to be aggressive so it is unlikely that there is much truth to this belief, although when cornered they will rise up onto their rear legs and swipe with their strong arms and long claws like a boxer. Curiously this boxing behaviour is also part of their courtship ritual. As their ant and termite prey can be found abundantly in all types of forest, the tamandua can be found in a wide range of arboreal habitats. To help the efforts to release rescued animals and protect their Ecuadorian Dry Forest habitat you can donate to the Keepers of the Wild project, as WLT funds ranger Armando in Cerro Blanco Protected Forest.